Click the button below to add the HES-MONITOR Home Energy Monitor to your wish list. A Smarter Way To Manage Your Home Energy Cost. Simple installation - No wiring or cutting needed. 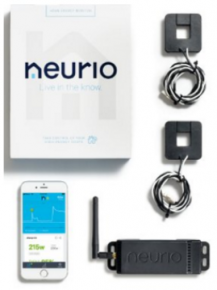 Once the Neurio Sensor is installed in an electrical panel, it will start sending the info to your smartphone or computer. Now you can see how much your home is consuming in real time. Top Appliance Usage - Shows you the top energy consuming appliances in your home. Track Your Appliance Usage - Shows you when your appliances are on and off and how much they consume. Smart Notification - Alerts you to energy savings and whats going on in your home when you are away.